EXCERPTS FROM “THE MAN BEHIND THE BATON” BY DR. WILLIAM P. FOSTER: Excerpt Three – Growing My Own Crop (Part 1) – Block Us Up! 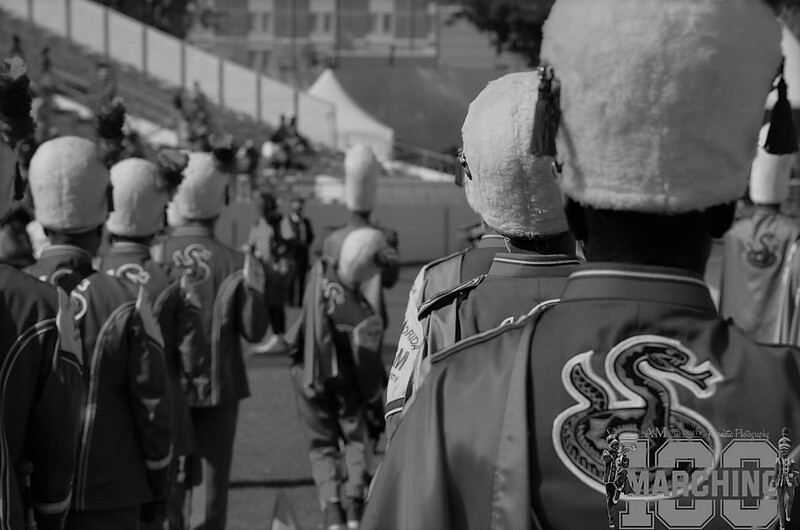 “By 1950 the marching band consisted of 110 members and became widely known as the “Marching 100” Band. It was about that time, also, that a “new sound” emerged that was said to describe the eighteen-piece percussion section, made up of four Scotch bass drums, four tenor drums, eight snare drums, and two pairs of cymbals. During the early years, because of a very low budget, the dress attire for the FAMC marching band consisted of their personal dark blue or black suits, trousers and coats; white shirts, black string ties; and black shoes – all furnished by the band members. The College purchased white web-cross belts, white spats, and black band caps. For several years after I arrived, the FAMC band donned blue/orange uniforms formerly used by the University of Florida marching band. Orange and green were and still are the school colors at FAMU… Another tremendous challenge I faced was the recruitment, evaluation, and training of initial faculty members. From 1946 to 1953 selections were made among selected band faculty and staff members from outstanding schools of music of such institutions as the University of Michigan, Ohio state University, the Juilliard School of Music, and Eastman School of Music. In recognizing our instructional dilemma, I decided that the situation required my developing and “growing” potential future faculty members who possessed the competence, performance ability, commitment, dedication, compassion, interest, empathy, and desire needed. Dr. William P Foster is founder and creator of the world renowned Florida A&M University Marching 100. He has been credited for the creation of the very first band dance routine, many marching techniques, drill patterns, and band pageants (Themed shows). All of these, and many more of his creations, are still utilized by college bands across the country today. Prev Post: THE QUAD… AND THE MESS! Next Post: BEING IN THE BAND CHANGED MY LIFE!